Will the Formula 1 race return to the Netherlands? Rumors started a year ago, when it was announced that the Formula 1 organization was contemplating bringing the Grand Prix to the Netherlands – just after the commercial boss of Formula 1, Sean Bratches, had visited the country to scout for possible locations. Suggested locations of interest were Rotterdam and Amsterdam. Rotterdam has previous experience with organizing such an event, such as City Racing and some Formula 1 demos. Although the streets of Amsterdam were deemed to be diffi cult for the race, the option was viewed as commercially feasible by the Formula 1 organization due its central location and the attraction it would bring. Think Amsterdam Grand Prix! After hearing the news, Circuit Zandvoort and TT Circuit Assen also showed interest in welcoming Formula 1 to the country. However, experts initially regarded them to be unattractive due to the state of the circuits and lack of accessibility, compared to Amsterdam. The idea to consider Netherlands as a Grand Prix location was announced just after the takeover of Formula 1 by its new owner, Liberty Media, which took over the underperforming organization from Bernie Ecclestone. Ecclestone was known to have declared during his leadership that the Grand Prix would never return to Zandvoort. Zandvoort last organized a Grand Prix in 1985, when Niki Lauda won. Liberty Media is looking to revitalize thesport by adding new circuits to the calendar. Bratches has stated that the Netherlands is not the only location being considered; 40 other circuits had also showed interest. But even more, the Netherlands is seen as a viable option due to the success of Dutchman Max Verstappen. “The Limburger has created such a hype. The sport has never been so popular in our small country and at every Grand Prix in the world, fans wearing orange are clearly visible. It is now or never for the Grand Prix to come to the Netherlands,” said Casper Bekking, editor-in-chief of nl.motorsport.com. 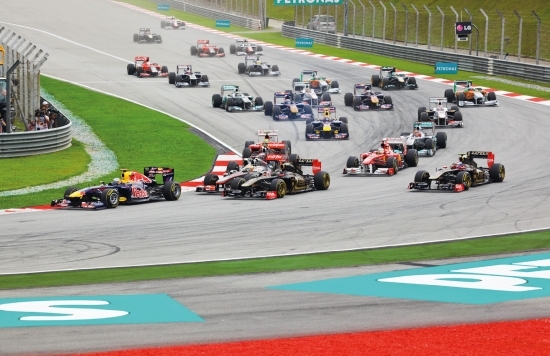 The popularity of Max Verstappen turned the Red Bull Ring in Austria orange. In Hockenheim there were more than 10,000 Dutch fans and at least 50,000 fans were present at Spa- Francorchamps to cheer for him. With the popularity of Verstappen, a race in his home country is guaranteed to be a fi nancial success. Think of the ticket sales, advertising, viewership stats, voting results for the driver of the day, etc. A Grand Prix in the Netherlands is guaranteed to be sold out. MotoGP riders said they hoped that Formula 1 wouldn’t come to Assen, due to the impact on the track surface and layout. “I hope [F1] doesn’t come here, firstly because of the bumps, and secondly because they will have to modify the track so much. It will be very strange to see the Formula 1 cars racing on a track that is completely green outside the racetrack,” said Valentino Rossi. “Here? Impossible. Because it is too tight. Too small, too tight. If they will make some changes… but I don’t think so,” said Andrea Dovizioso on the viability of the Assen circuit. “Formula 1 would be very, very fast, because [there’s] many fast corners and maybe the lap time would be one minute, I don’t know, because they are so fast,” said reigning champion Marc Marquez. As of July this year, Assen was waiting for the Formula 1 and International Motorsport Federation (FIA), together with a team from the technical committee, to inspect the practical issues and logistics around the circuit. “You have to think of housing and the pit boxes that are probably too small, but there is already a solution to double the space. There will be no insurmountable problems,” said Lee van Dam, the promoter of Assen. Van Dam reached out to the well-known German architect of Formula 1 circuits, Herman Tijke, who visited the circuit and sketched some minor changes. Although the plan is to organize the fi rst Grand Prix in 2020 or 2021, Assen can organize the race earlier. There are already 60,000 seats and 28,000 parking spaces available. When it comes to organizing a Grand Prix, fi nancing is one hurdle. Apart from having a qualifi ed circuit and satisfying other logistical requirements, 20 million has to be found to pay the Formula 1 organization. But according to recent information from Van Dam, various parties have already offered to f nance the race in Assen. One British investor is seen as the best option. “But even without the Brit we can do just fi ne, because two Dutch investors have agreed to fi nance,” said Van Dam. After the release of the feasibility study from Zandvoort, the Minister of Healthcare and Sport, Bruno Bruins, was asked in parliament about the possibility of bringing Formula 1 to the Netherlands. He gave a reluctant response. “The report from the Zandvoort circuit is a fi rst exploration, but there are too many uncertainties to come up with a concrete request for advice to the Dutch Sports Council,” said Minister Bruins last year. Currently, the situation has changed after positive feedback from Formula 1 organization. The municipalities are in a tug of war. The Zandvoort VVD party leader, Martjin Hendriks, said recently: “ We are in competition with the municipality of Assen to show our ambition for bringing Formula 1 back to Zandvoort.” He stated that a substantial contribution from the municipality was possible and a municipal committee has called the for the race to be included as a project in the town’s strategic investment agenda, in order to make structural contribution to activities that would promote the return of Formula 1 to the municipality. On the other hand, the municipality of Assen and the province of Drenthe also embrace the plan to bring back the race to their circuit. “I see this as an opportunity for Drenthe. Together with us, the whole of the northern Netherlands is enthusiastic about the arrival of Formula 1. Bringing in Formula 1 creates a great economic benefi t for the region and puts Drenthe on the world map. However, unlike Zandvoort, a fi nancial injection from the local government has not yet been promised.” Now all we can do is wait to hear the decision of the Formula 1 organization.